Located in the First Coast region of northeast Florida and centered on the banks of the St. Johns River is the thriving city of Jacksonville. Having the largest population in the state and being the largest city by area in the United States makes it an incredibly popular and important place to be. The city of Jacksonville has grown into a major military and civilian deep-water port, hosting two Navy bases and the renowned Port of Jacksonville. The alluring scenery includes a mixture of modern skyscrapers and historic districts lining the incredible rivers and ports. This unique combination of the old and the new creates a strong and interesting culture in the area, which is fostered by cultural events such as the Jacksonville Jazz Festival, Springing the Blues, and The World of Nations Celebration. While Jacksonville features many exquisite businesses and homes, these structures are actually exposed to an incredibly humid subtropical environment. With the heat index reaching over 110° and an average rainfall of 52” per year, Jacksonville foundations experience an unusually high level of stress. These savage conditions tend to cause problems such as foundation failure, sinkholes, and seawall erosion. Yet no matter how intense the situation, Solid Foundations is able to rescue the living and working structures of Jacksonville with our professional foundation repair, sinkhole remediation, and seawall repair services. Ocala home and business owners should make a conscious effort to check for these signs of foundation problems, and when they discover them, the best response is to contact Solid Foundations to receive our Jacksonville foundation repair services. Our pier systems are provided by Grip-Tite®, and they all come with a lifetime transferrable warranty. These guaranteed methods allow Solid Foundations to supply Jacksonville homes and businesses with stable and dependable foundations upon which to rest their lives and their trust. While soil and limestone may have served as the first level of your foundation, it is sometimes necessary to upgrade your building to the next level, which is a quality foundation fix that only Solid Foundations can supply. Jacksonville, being in northeast Florida and flanked by bodies of water, has an unfortunately large number of sinkhole occurrences. The geological foundation of the area is porous limestone, a material that is easily corroded. As the frequent acidic rain flows through the limestone, it disintegrates the lower layers until the only layers remaining are thin upper layers. When triggered by the appropriate amount of weight, the collapse of these layers can happen all too easily. When any one or more of these sinkhole indicators are noticed, Jacksonville locals must not hesitate to take action, and that action should include calling Solid Foundations to assess the situation. Solid Foundations will inspect the severity and causes of the sinkhole problem, and solve any issues that may be threatening your property. Our geotechnical knowledge and experience empower us to quickly and productively manage sinkhole situations with our Jacksonville sinkhole remediation services in order to provide a safer environment for all Jacksonville homes and businesses. Being flanked by bays, waterways, and the St. John’s River, Jacksonville is a wondrous waterfront city that offers all of the recreational amenities associated with access to water. However, though the water is beautiful, it can pose a large threat to the foundations of nearby buildings, and therefore, the buildings alongside the ocean and rivers employ seawalls to combat the constant battering of harsh elements such as wind and waves. However, under these same pressures, seawalls in Jacksonville, Florida, can begin to crack, sink, rotate, or bulge, eventually leading to total seawall failure when deterioration persists. Seawall failure is a scary prospect for waterfront properties, one that many home and business owners are unsure of how to prevent or handle. However, the answer to their concerns is Solid Foundations, who, with our Jacksonville seawall repair services, can both prevent current seawall damage and prevent any further problems for years to come. The compaction grouting and void filling features of our seawall repair services are just want deteriorating seawalls need to fulfill their purpose again and to keep Jacksonville waterfront properties safe, secure, and dry. Throughout the state of Florida and especially in Jacksonville, residents rely on Solid Foundations to provide expert foundation repair, sinkhole remediation, and seawall repair. 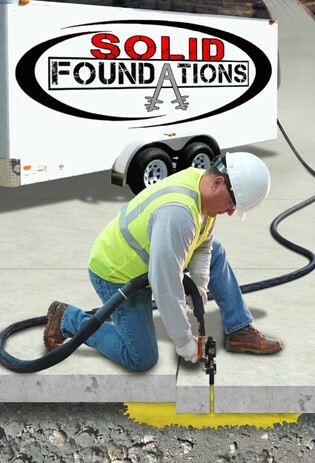 In addition to these services, Solid Foundations also offers crawl space repair, slab lifting and leveling, void filling, pipe and structure leak repair, soil stabilization services, and French drain installations that can solve any other structural complications that the people of Jacksonville may encounter. No matter your foundation problem, Solid Foundations has the fix you need, so contact us today for your Jacksonville, Florida, foundation repair services!